The Wandering Blogger – Talking about most anything. Agree to disagree. My post called I Cry Daily started out “I have to admit I never saw myself as a caregiver to my husband”. Well, I am no longer a full time caregiver. As quickly as it took him to take his last breath I went from wife to widow. After battling brain cancer since January of this year my husband of 46 years was gone on Friday, October 19 at around 4 am. Today, at 4:00 am I lay here wondering why and not understanding what God has in mind taking my husband, father of our three children, grandpa to three and friend and colleague to many. Sitting in limbo space between burial and Memorial Service I wonder why and wondering if I know how to live as a single person having been engaged second semester of my senior year of high school and married at age 20 we were rarely separated for any length of time. Interrupting my wondering wandering I hear the bling of a notification on my phone and actually feel prompted to see what it is that would show up at 4:03 am on Twitter. Never question if God answers prayer. We just need to be available to hear his answer no matter how he sends it. And so, I am back to my New Years commitment – whatever happens in 2018 make it count. And, I still cry daily. I have to admit I never saw myself as a caregiver to my husband. And yet here we are. Some days I feel like I am in one of those Hallmark movies where you fall asleep and wake up with another life. There are days I wonder if I will ever get my husband back as his personality has changed some. Hoping it is just inflammation, steroids or one of the many meds he takes. I expect him to walk out of the next room, I need to go somewhere and I expect him to come along and drive or make one of the many financial decisions. I am still in denial and I cry daily. A friend posted this on FB not too long ago. This is very meaningful as I contemplate my new role as a full time caregiver to my husband. We have been actively serving in our church with leadership responsibilities. But that changed when a routine back surgery ended up as a discovery procedure and after several CT Scans and MRI’s the final diagnosis is brain cancer. My husband has brain cancer. His left side is nearly paralyzed. Radiation could help if it shrinks the tumor and he gets full use of his left side again. So, in a sense we both feel shut up and really have no interaction, except by email, texting or FB although family members do stop by when they can and have really helped with a lot of things we take for granted. So we have decided that Satan will not shut us up. BUT since we already have access to Jesus Satan has already been thwarted and this blog will be our voice. Shout to the LORD, all the earth; break out in praise and sing for joy! Psalm 98:4 NLT. He loves you. He has a plan for your life. Don’t let the newspaper headlines frighten you. God is still sovereign; He’s still on the throne. As a believer in Christ, it is always a comfort to know that God is always in control and His timing is perfect. I have seen this so many times in my life. And yet, I don’t know about you, but I’m kind of glad the holidays are over – for now. Not that I don’t love Christmas because I do. I mean I always over decorate, over cook, over bake plus I think I watched every Christmas Hallmark movie for this year about ten time plus some timeless old favorites like Miracle on 34th (in B&W – thank you) and White Christmas. But, this year, I decided to try to keep it simple. To actually focus on the reason for the season and not the doing of the season. And I did succeed pretty well. But, no matter what, every year, good or bad, as we approach New Year’s Eve I look forward to and long for my family’s Peaceful Pause. One of our traditions, even when our kids were little, is on New Years Day we plan and cook a special breakfast, watch the Rose Parade and then the Rose Bowl game and any other worthy football games that may be on TV. When we lived in California that meant getting up at the crack of dawn for the parade, or at least it felt like it (now that we live in Texas we even get to sleep in a little longer). But we stayed in our jammies most of the day. We may have reminisced about the previous year or what we might do in the new year or not. The kids may have played with their new toys – but mainly we just vegged and snuck in a long, overdue nap. Sometimes we would hang around the house or we might go outside and play. Of course, we did that much more when the kids were little. And then last, but not least, all the Christmas decorations are taken down and packed away. It is just one peaceful serendipitous day¸ wrapped in our own warm and cozy cocoon of peace and love and tucked in between the weeks of chaotic, joyful holiday activities, and the reboot of the rat race that is our life. That is our own peaceful pause! What do you do on New Year’s day? Is making resolutions part of your new year plan? How was 2017 for you? Comment below. And with that, I want to wish you all a Happy New Year and whatever happens this year – ask the Lord to make it count. December 7 is the date that most people associate with Pearl Harbor and remembering the sacrifices that were made. But for my sister it means it is her birthday and every year we do something to celebrate usually going out to a nice dinner with our husbands. But not this year. She wanted to go to Magnolia Market at the Silos in Waco, Texas. So, our road trip started when she picked me up around 11 am. Fortunately, Waco is only about 2 hours away. Sis had already been to Magnolia Market but it was quite hot that day, the bakery had recently opened and the line was out the door and across the street. There was a line for Magnolia Market as well. This time it was completely different. When we hit the road it was pretty cold, maybe 46 degrees and falling, overcast and gloomy. We made it in great time and started looking for parking. Driving past the bakery there wasn’t a line, well that was encouraging. Saw the little free parking signs and we thought, “let’s check it out – what do we have to lose?” Not only did we get a free parking place, it was right near the gate. Walking through the gate we found the food trucks. We continued past the green area and made our way to the bakery. There was a line but it was inside! Yay! So we filled out our order cards, grabbed a couple of Silo Bakery t-shirts and found ourselves at the front of the line. Waiting just a few minutes for our order we took it outside to the patio area. It was still cold! The coffee was great and the nutty cinnamon roll with pecans, walnuts and cream cheese icing is to die for. When we finished our cinnamon roll, (did I mention they are HUGE?) which we ended up sharing, we headed over to Magnolia Market and wandered around there for an hour or so, completed our purchases and took them out to the car. While sitting there trying to decide where to eat we kept hearing something hitting the windshield but couldn’t see anything. We decided to get lunch at one of the food trucks and sit in the car and eat. We each ordered the tomato basil with roasted butternut squash soup and split The Boss – bacon, Gouda and basil on sourdough from the Cheddar Box food truck. Took our comfort food back to the warmth of the car and enjoyed a perfect lunch on a cold and gloomy day. When we finished we went to throw our trash away and use the restroom. When we came out the green grass area was almost empty. We were soon the only people outside! And then some little snow flurries started! So, Sis decided to do a FB Live and to date there are over 100 views. Crazy! She named it Magnolia Silos, Snow and my birthday. Then a quick trip to the Magnolia Seed Supply. Grabbed some coffee from Common Grounds food truck and decided to take a quick driving tour of Baylor University since it is on my granddaughter’s short list. Snapped some pics and headed back down the road from whence we came. Sorry this was so long, but when you have one of the special, perfect days with your sister where everything comes together and then is topped with snow – you gotta share it! Happy Wandering and wishing you a perfect Merry Christmas. . . . . I was born and raised in California, but with deep Texas roots. So, I got to Texas as fast as I could. After living here 20+ years Texas and its people still continue to amaze me. When Harvey hit and the devastation was revealed I know everyone cried with them and wanted to rush down there, hug them, and help fix everything. The problem was there was no easy or good way to get there, plus the First Responders (from all over) were there and we would just be in the way But with the aid of the locals they began to search, rescue and clean up. But some things are just not fixable. 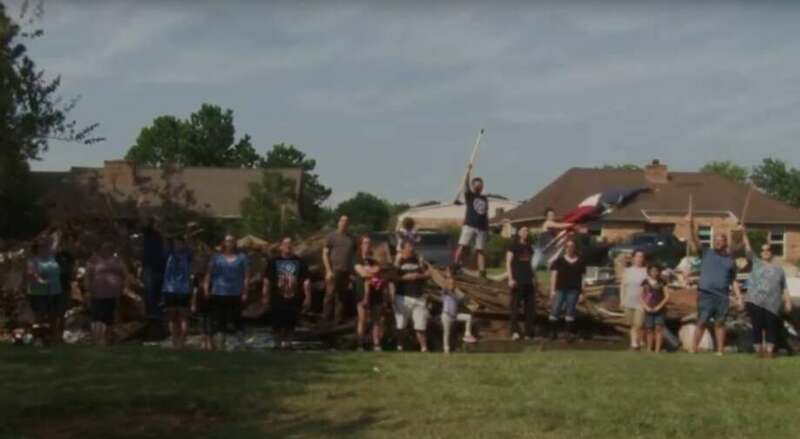 But the Texan spirit does still prevail and although we have seen a lot of things since Harvey descended and practically leveled south Texas I bet you never expected to see this. This is what Texans are made of.